Home / Best Slow Cooker Tips / What size of slow cooker should I get? Slow cookers have different sizes in quarts. Choosing a right size for your slow cooker that fits for your family is very important. What kinds of sizes of slow cookers are on the market? Single: A standard capacity of 1.5-quart will feed one adult. However, most 1.5-quart slow cookers are manual, not programmable. 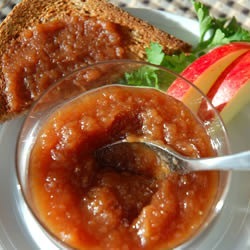 For most of recipes, simply cut in half and you will fit everything in your slow cooker. I personally think that Proctor Silex 33015 1-1/2-Quart Round Slow Cooker is a good choice. Or you can check out my full list of best manual control slow cooker here: http://best-slowcooker-reviews.com/best-manual-slow-cooker-2012/. Two adults: If you have two adults, then 3 to 4 quart size will work really well for you. 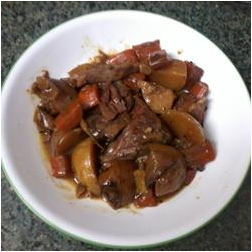 This is also called standard size as most slow cooker recipes are designed for this size. Normally if you follow recipes, you will have some leftover for the next day. For this size, I highly recommend Cuisinart PSC-350 3-1/2-Quart Programmable Slow Cooker. 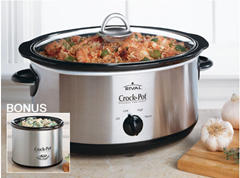 If you like manual slow cooker for this size, I would recommend Crock-Pot SCR300SS 3-Quart Round Manual Slow Cooker. Hamilton Beach 6-Quart Manual Slow Cooker. Please see my full Hamilton Beach 33967 Set n Forget 6-Quart review here or check out my full list of Best Programmable Slow Cookers.